I think that’s the wrong question. Of course the indie web cannot scale. But that’s a feature, not a bug. Scale — as-big-as-possible, universal-not-local, something-for-everyone scale — is the enemy. It’s the biggest enemy that community and fellowship and friendship can possibly have. If it scales, I want no part of it. The blogs I’ve written for (Kottke notwithstanding) have only had so much ability to retain me before they’ve changed their business model, changed management, gone out of business, or been quietly abandoned. They’re little asteroids, not planets. Most of the proper publications I’ve written for, even the net-native ones, have been dense enough to hold an atmosphere. I’d very much like to dismiss what Tim says here — but I don’t think I can. He’s probably right. (And the asteroid/planet metaphor is an especially fertile one.) In light of Tim’s account of his experience, I’ve been reminded that my own opting-out of social media is a luxury — and I am therefore all the more grateful for that luxury. On Tuesday morning, January 22, I read a David Brooks column about a confrontation that happened on the National Mall during the March for Life. Until I read that column I had heard nothing about this incident because I do not have a Facebook account, have deleted my Twitter account, don’t watch TV news, and read the news about once a week. If all goes well, I won’t hear anything more about the story. I recommend this set of practices to you all. On Saturday at 1201am I turned off my social media. I have a private IG account for looking at nice pictures, and Twitter lists for news, but I’m not posting on or participating in the public internet for the next several months. I tell people on my newsletter, all the time, to tune their internet connections until they are useful and fun. The public internet stopped being fun for me some years ago, and I disconnect from it for half of each year at least. I like newsletters, blogs and RSS, podcasts, email, messaging apps and complete thoughts. The public network turned into something I don’t really enjoy or get anything out of. Beyond Comments: Finding Better Ways To Connect With You : NPR Extra : NPR. I think all of us have wondered, after looking at the comments on virtually any page, how many sociopaths walk among us. I know I’ve seen some horrible, horrible things over the years, and it affects my overall attitude toeards humanity. In light of those experiences, this data is somewhat encouraging — at least in one sense: it suggests (doesn’t prove, but suggests) that the truly hateful are a pretty small percentage of the population. If only 0.003% of NPR.org users are commenting, and if only some of those are vile, then maybe complete social collapse is a little further away than I have sometimes feared. But such a number also suggests how effectively some of the nastier people in our society have employed comment threads — and Twitter — as their megaphones. So if we’re going to avert an outright tragedy of the online commons, we’ll need to find ways to reduce the influence of those people to a level commensurate with their actual representation in the population. NPR’s closure of comments is a step in the right direction. We can see this above in relation to contemporary Anglo-Saxon moral philosophy, as well as in the drive to codification in liberal society. But the sources go back deeper in our culture. I want to argue that it was a turn in Latin Christendom which sent us down this road. This was the drive to reform in its various stages and variants — not just the Protestant Reformation, but a series of moves on both sides of the confessional divide. The attempt was always to make people over as more perfect practicing Christians, through articulating codes and inculcating disciplines. Until the Christian life became more and more identified with these codes and disciplines. Code fetishism means that the entire spiritual dimension of human life is captured in a moral code. Kant proposes perhaps the most moving form of this (but perhaps the capture wasn’t complete in his case). His followers today, be they Rawls or Habermas or others again, carry on this reduction (although Habermas seems to have had recent second thoughts). Modern culture is marked by a series of revolts against this moralism, in both its Christian and non-Christian forms. Think of the great late nineteenth-century reaction in England against evangelical “puritanism” that we associate with names as diverse as Arnold, Wilde, and later Bloomsbury; or think of Ibsen; or of Nietzsche and all those who follow him, including those rebelling against the various disciplines that have helped constitute this modern moralization, such as our contemporary, Michel Foucault. But it is the concept which runs alongside the constant and essentially unconsented gathering of data which is most mendacious: the contention that privacy is a luxury, a bygone; an unnecessary and even regressive notion in a technological age of openness and a hinderance to the safeguarding of a just society. It is precisely in a technological society that privacy emerges as a central, vital plank of legitimate democratic function. It might be different if openness were universal, if we could scrutinize the choices of our leaders and hold them to account; if we could get unvarnished access to information about the things we buy and the services to which we subscribe, and know the probable consequences of our decision rather than be soothed with pablums and misdirections; if we were encouraged and enabled to participate in the creation of the world, rather than sidelined as the governed, the consumers. But this is not an era of radical transparency across the board. It is not an era of growing direct democracy. It is the era of transparency for the masses, of autocracy dressed as liberty. The powerful are concealed by law and contract, and by power. The rest of us are exposed and encouraged to think of this exposure as freedom. There is a significant psychological price to being constantly aware of the variety of ways in which your activity might be tracked. To be blunt, it makes you feel crazy. That is why, if you want a quiet life, you shouldn’t make friends with security analysts: they tend to get drunk and describe the ways in which your phone can be turned into a listening device until the skin on the back of your neck starts to crawl, because it’s their job to know about such things. There is a non-zero cost to this sort of awareness. In a choice between paranoid vigilance and easy participation, few choose paranoia. It’s just easier to change your behaviour. A friend who works in computer security told me that “the most important censorship happens between your head and your keyboard”. Self-censorship is significant in a world where, increasingly, as the tech journalist Quinn Norton observes, “falling in love, going to war and filling out tax forms looks the same: it looks like typing”. In 1971, however, a keyboard with a vestigial @ symbol inherited from its typewriter ancestors found itself hooked up to an ARPANET terminal manned by Ray Tomlinson, who was working on a little program he’d come up with in his goofing-off time to send messages from computer to computer. Tomlinson ended up using the @ symbol as the fulcrum of the lever that ultimately ended up lifting the world into the digital age: email. It was as simple as that, but through this one serendipitous accident of typography, @ became the navel of the digital body we now call the Internet. It stopped being a sign for how much something cost and became a symbol of an infinite number of end points on a digital umbilicus: an origin, a destination, or some point–terminating in a human–in the system in-between. The deeper problem with the nothing-to-hide argument is that it myopically views privacy as a form of secrecy. In contrast, understanding privacy as a plurality of related issues demonstrates that the disclosure of bad things is just one among many difficulties caused by government security measures. To return to my discussion of literary metaphors, the problems are not just Orwellian but Kafkaesque. Government information-gathering programs are problematic even if no information that people want to hide is uncovered. In The Trial, the problem is not inhibited behavior but rather a suffocating powerlessness and vulnerability created by the court system’s use of personal data and its denial to the protagonist of any knowledge of or participation in the process. The harms are bureaucratic ones—indifference, error, abuse, frustration, and lack of transparency and accountability. A while back the Atlantic Tech Channel’s Megan Garber was entertaining us with adventures in Google’s search-autocompletion features: what she called Google Psyche. (Google gives their own explanation of the feature here, but essentially it makes suggestions for you based on the frequency of previous searches. Again, all this is pretty funny – but it may even be useful, at least to some of us. Maybe even academics like me. (The “mbta” Michael Donaghy is not the poet.) 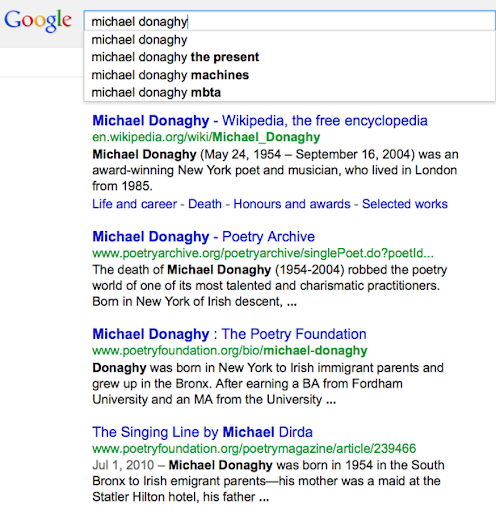 These results tell me that the two most searched-for poems by Donaghy are “The Present” and “Machines”: the former, presumably, because it might plausibly be read at a wedding, but the latter because – well, because it’s just utterly beautiful, a fabulously intricate yet accessible poetic construction. “Machines” is my favorite poem by Donaghy, but Google’s algorithm suggests that it is beloved by others as well, something I didn’t suspect until I ran that search. 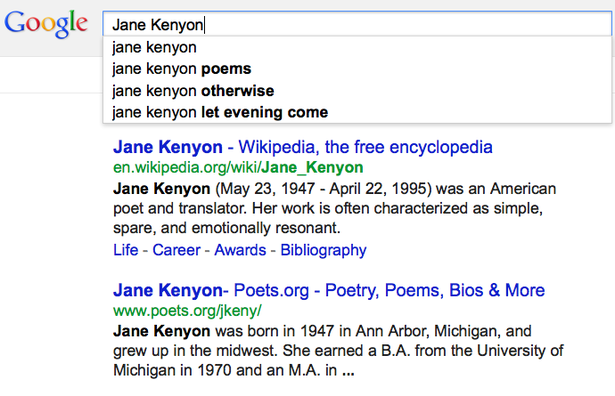 It surprised me to bit to find “Otherwise” listed before what I always think of as the definitive Jane Kenyon poem, the simple but perfectly graceful “Let Evening Come”, but actually running the search for “Otherwise” revealed to me that it is often taught in American high schools. 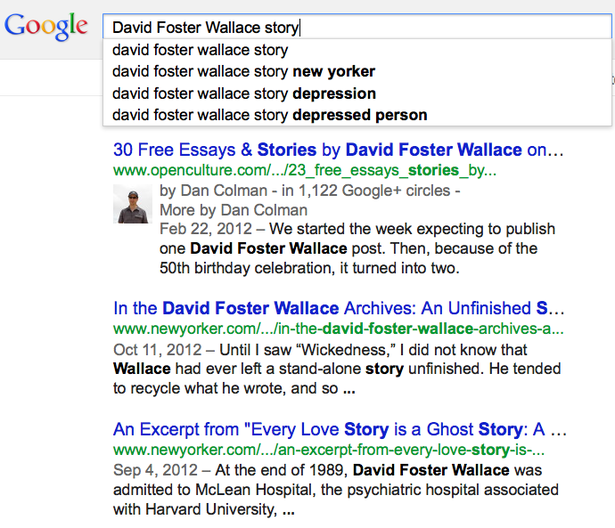 Clearly the chief interest is in “The Depressed Person,” a 1998 story thought to be revelatory of Wallace’s own experiences with depression. 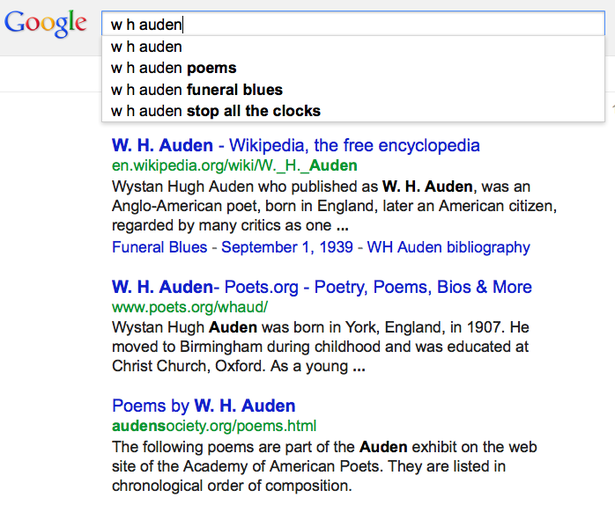 A search for W. H. Auden shows that the first poem of his people want to know about is “Funeral Blues”, a poem that hardly anyone knew until it showed up in the 1994 film Four Weddings and a Funeral. It seems to me that this information is not trivial: anyone interested in a particular author or topic could, with sufficient discipline and knowledge of how to make a screen cap, track shifts in public interest and knowledge over time. 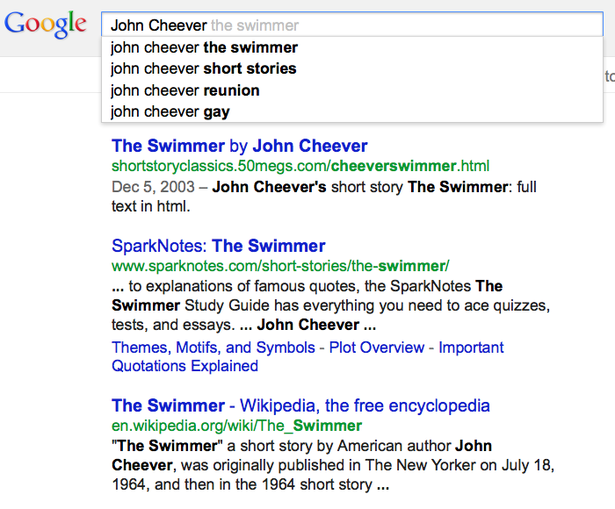 It would be like Ngrams for searches instead of published material. 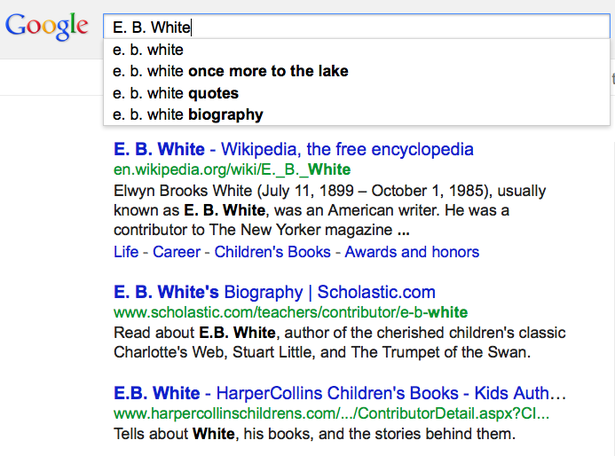 Google is of course already providing us with its own accounts of its most ed-for terms, in the Google Zeitgeist; but I’m suggesting the value of tracking searches that don’t rise so high in the public consciousness, but significant to scholars and other researchers who focus on particular topics. Because I’m a literature teacher, I focused here on literature, but this kind of tracking could be done in almost any field. Digital humanists – and social scientists, and historians of science, and Lord knows who else – take note! I propose we abandon the Internet, or at least accept the fact that it has been surrendered to corporate control like pretty much everything else in Western society. It was bound to happen, and its flawed, centralized architecture made it ripe for conquest. Just as the fledgling peer-to-peer economy of the Late Middle Ages was quashed by a repressive monarchy that still had the power to print money and write laws, the fledgling Internet of the 21st century is being quashed by a similarly corporatist government that has its hands on the switches through which we mean to transact and communicate. It will never truly level the playing fields of commerce, politics, and culture. And if it looks like that does stand a chance of happening, the Internet will be adjusted to prevent it. Of course, the model that Zuckerberg is hoping to replace isn’t the Peel show but the search engine. If Zuckerberg gets his way, Facebook recommendations will replace Google searches as the main route by which we navigate to websites. This would hardly be a paradigm shift; more a tidying up, combining what are currently two steps into one. With a search engine, you have to know more or less what you’re looking for before you begin: there’s an implied recommendation preceding most things we type into Google. What Zuckerberg’s betting on is that those recommendations will increasingly be made online, with a direct link, so the work you now ask Google to do will already have been done. As for the first question, why people are so unfussed by Facebook’s lack of privacy, it must in part be because the site fosters the illusion that you’re among friends. The success of Facebook implies that most people are more comfortable thinking of the internet as an extension of their offline lives, where everything and everyone they are likely to encounter is already known to them. Which is all very well, but it does mean that the overweight kids in glasses get bullied there too.